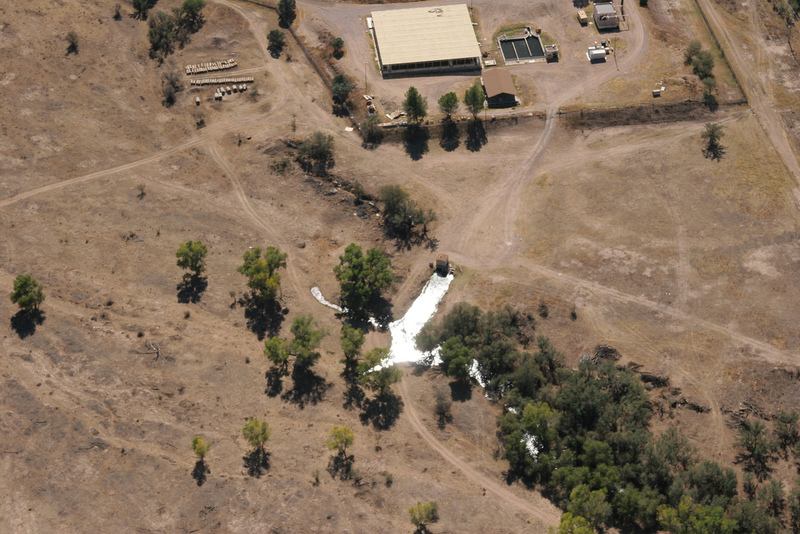 The spot where treated water leaves the plant and begins flowing into the Santa Cruz River. Trees and vegetation demonstrate that the river is healthy along this section near Tucson, Arizona. 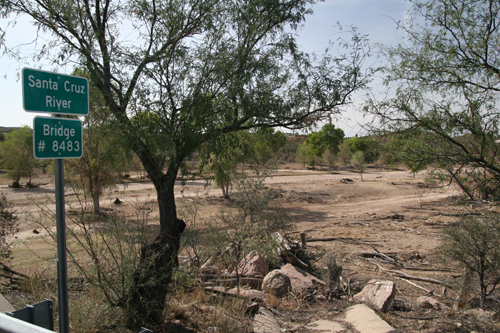 Just south of the US border, the Santa Cruz River is a dust bowl, a scarred ditch tapped dry by the booming twin cities of Nogales, Mexico and Nogales, Arizona. Not long ago, people waded in and held baptisms in the river. Today it looks like fire has destroyed the riverbed and the trees beside it. But it’s a very different story a couple of hours farther into Mexico. Lorne Matalon has the story. San Lazaro, Mexico – population 600 – it’s on the floor of a remote valley crisscrossed by warrens of paths carved into the boundless Sonoran desert. It’s where the Santa Cruz starts wending its way north toward the U-S. And it’s where 20-year-old Arturo Alvarez leads a group of young people working on a restoration team. ‘We’re watching bird migration patterns,’ Alvarez says. The group is known as Los Halcones– the Hawks-and it’s also monitoring the river’s temperature, and the health of the vegetation lining its banks. Less than a decade ago, little took root here. The protective underbrush and cottonwood and mesquite saplings had been trampled by cattle and horses. But Los Halcones have fenced off two miles of the river and saplings are now abundant. “The work done here is to preserve the river,” says Alfonso Gonzales, a baby-faced, 44-year-old sheep farmer with grizzled hands that speak to a life on the land. He collects Los Halcones’ data shares them with the Tucson, Arizona-based Sonoran Institute. The groups are key parts of a bi-national effort to salvage a river crucial to both countries. Los Halcones also shares its data with the International Boundary and Water Commission, the bilateral agency that works to resolve water problems along the border. Agronomist Gilberto Solis Garza is an advisor to the Commission. He also works with Los Halcones and the Sonoran institute. Solis says the Santa Cruz is a symptom of stress on the border region’s water supply. Just a few miles north of San Lazaro, the supply does end as the Santa Cruz passes through the crowded border region. But not far beyond that, in the US, the river makes a dramatic comeback. From less than a thousand feet up, pilot and conservationist Dan Meyer points out a stretch of river where a sun-bleached ribbon of sand is suddenly replaced by lush green ribbons of cottonwood, willow, and mesquite trees. The water on this stretch of the Santa Cruz comes from a wastewater treatment plant. The plant is in the US, but it treats sewage piped underground from Mexico. Biologist Amy McCoy of the Sonoran Institute says the cross-border wastewater transfer is helping revive a major part of the river and the local ground water. McCoy says pressure on the Santa Cruz is growing, as the river is squeezed between increasing demand and a likely further drop in rainfall due to climate change. That means this kind of recycling is the wave of the future. But it’s not a sure thing that the cross-border wastewater deal will continue. Nogales, Mexico has threatened to stop sending its effluent to Arizona unless it gets paid for the water. Negotiations are now underway. One American negotiator hopes a new deal will fund an upgrade of the Mexican city’s run-down water system. 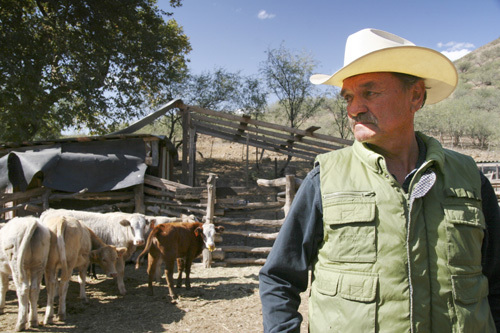 Back in Mexico, rancher Ventura Rivera Medina lives on a tributary of the Santa Cruz; He might benefit from such a project. But he’s not waiting. 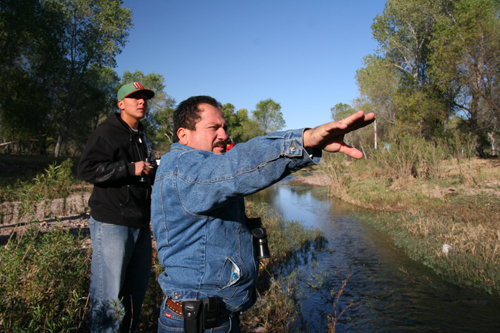 Working with the Sonoran Institute, Medina has built 3-foot-high rock walls-he calls them mini-damns–with his bare hands to capture and channel precious rainwater. He uses what he needs and diverts the rest back into the river. Rivera says ranchers on both sides of the border need to take the initiative to conserve water and restore the Santa Cruz. Negotiations on a new water deal that could bring more government support for the restoration effort are progressing slowly, while the Santa Cruz continues to live its two lives; As a dried out skeleton of a river and a restored waterway venerated by a new generation of river activists on both sides of the border. This entry was posted in BBC's The World, Photography, Radio and tagged Arizona, Los Halcones, Mexico, Sonora, water conservation. Bookmark the permalink.